Those are things many of us took for granted, but they're the things that made that moment a celebration of all our accomplishments. 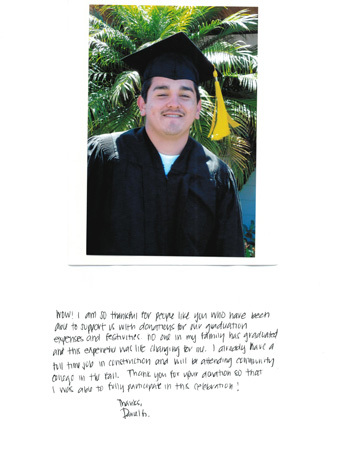 Pete Martin, a member at St Anne's Episcopal Church in Oceanside and an employee of Interfaith Community Services, came to the St. Anne's congregation and shared with us a great need for some graduating seniors at Oceanside High School. These kids were not going to be able to participate in any of the graduation activities, could not afford a yearbook, or even walk in graduation itself because of the high costs. Many of these kids would be the first ones in their families to even graduate from high school. Pete shared that the seniors he was personally working with all had college/trade school or work plans already in place. These are kids that deserved to be rewarded for working hard to overcome the obstacles in their lives. Although we are a very small congregation, we knew that we had to get involved! We collected enough money to sponsor one graduating senior. We received a picture and a thank you from Daniel. You can read his words below. "Wow! I am so thankful for people like you who were able to support us with donations for our graduation expenses and festivities. No one in my family has graduated and this experience was life-changing for me. I already have a full-time job in construction and will be attending community college in the fall. Thank you for your donation so that I was able to fully participate in this celebration! Thanks, Daniel G."
We at St. Anne's are so very grateful that the Lord gave us the opportunity to serve. It is in giving that we ourselves receive. We encourage you to look around, open your eyes and see the little opportunities you have right in front of you to make a HUGE difference. "When you do it unto one of the least of these my brothers, you have done it unto me," (Matthew 25:40). St. Anne's Episcopal Church is located at 701 West St. in Oceanside, Calif.
Visit us online: www.stannesoceanside.org or stop by on Sundays at 10 a.m.